The Golden Wattle is Australia’s floral emblem, the botanical,name is Acacia pycnantha and it has many uses indeed. Used as a bush tucker food, golden wattle seed is easy to germinate given a little ‘treatment’, it is also an attractive flowering plant. According to traditional users the seeds of Acacia pycnantha can be roasted and then eaten. Also used for wattleseed flower, and even for flavouring ice-cream. The foliage (phyllodes rather than true leaves) secret nectar which attracts birds as well as ants. 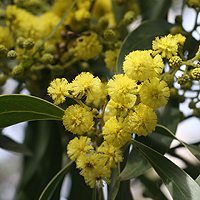 Found widely across south Australia, through Victoria and to New South Wales the beauty of this tree is the masses of golden flowers produced in winter through to spring. The seeds of the golden wattle take a while to mature after flowering, and are generally not ready to harvest until mid to late summer. Used widely in land regeneration as it is fast growing and has the ability to fix nitrogen into the soil. These seeds hang in long pods and the individual seeds are hard coated, in natural circumstances it would be fire that sparks germination. In propagation we need to look at other methods. Abrasion is one method used, try two sheets of sandpaper and rub the seeds between then, boiling for 1 – 2 minutes is another and for individual seeds a small nick with a razor blade or sharp knife seems to work. Seed from the Golden Wattle should germinate with 2 weeks after treatment. This is not a plant that really requires much care at all once established, use a tree guard to prevent damage when first planted and keep watered through the first summer. Fertilizer is not generally required although a specialist low phosphorous Australian Native plant fertilizer can be used. Height – To 10 metres tall, often smaller. Spread – will form a broad crown to 8 metres over time. Flowers – Golden yellow in winter to spring.